Clear Liquid Nutritional Drink for People with Diabetes. This clear liquid supplement for people with diabetes, is a good source of protein, arginine, and vitamin C to help support wound mangement. 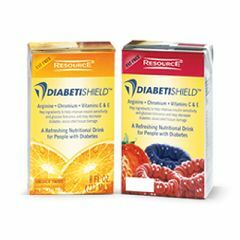 There's a lot to like about DIABETISHIELD®. It's a good source of protein and arginine, which helps support wound management. This formula comes in Mixed Berry and OrangeTwist flavors and is available in an easy-to-carry drink box. Ingredients: (Orange Twist) Water, Corn Syrup, Whey Protein Isolate (Milk), L-Arginine, Phosphoric Acid, Citric Acid, Malic Acid, Natural and Artificial Flavor, L-Cysteine, Sucralose, Yellow 6. Vitamins and Minerals: Ascorbic Acid, Alpha Tocopheryl Acetate, Zinc Sulfate, Ferrous Sulfate, Niacinamide, Calcium Pantothenate, Copper Gluconate, Vitamin A Palmitate, Manganese Sulfate, Pyridoxine Hydrochloride, Thiamine Hydrochloride, Riboflavin, Chromium Chloride, Folic Acid, Biotin, Potassium Iodide, Phytonadione (Vitamin K1), Cholecalciferol (Vitamin D3), Cyanocobalamin (Vitamin B12). (Mixed Berry) Water, Corn Syrup, Whey Protein Isolate (Milk), L-Arginine, Phosphoric Acid, Citric Acid, Natural and Artificial Flavor, Malic Acid, L-Cysteine, Sucralose, Red 40, Vitamins and Minerals: Ascorbic Acid, Alpha Tocopheryl Acetate, Zinc Sulfate, Ferrous Sulfate, Niacinamide, Calcium Pantothenate, Copper Gluconate, Vitamin A Palmitate, Manganese Sulfate, Pyridoxine Hydrochloride, Thiamine Hydrochloride, Riboflavin, Chromium Chloride, Folic Acid, Biotin, Potassium Iodide, Phytonadione (Vitamin K1), Cholecalciferol (Vitamin D3), Cyanocobalamin (Vitamin B12).